Most long-term disability (LTD) claims are evaluated by claims adjusters who work for the insurance company. Unfortunately, because ERISA regulations favor insurance companies, claims handlers routinely deny legitimate claims even where the medical evidence of disability seems to be clear. Claims handlers deny disability applications on behalf of the insurance company for many reasons, some of which are legitimate and many more that are illegitimate. Understanding some of the reasons as to why claims are denied may help you prepare your best possible case. 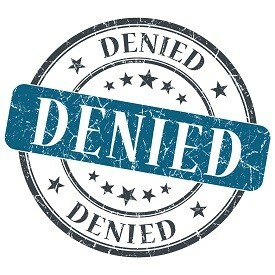 Here are some of the most common reasons why LTD claims are denied. Regular Medical Treatment. It is nearly impossible to win a long-term disability case without obtaining regular medical treatment. Your insurer expects your claim to be well supported by medical records, and will expect to see evidence of regular, ongoing visits to your primary care physician and other medical specialists (as appropriate). If you suffer from a mental / psychiatric condition (such as depression or anxiety), the insurance company will expect you to see a mental health provider, preferably a psychiatrist or psychologist, at least once a month. If you have a physical medical impairment, the insurance company will expect to see evidence that you are visiting the doctor on a regular basis and that your doctor is ordering objective tests, including x-rays, MRIs, or CT scans, whenever possible. Missing Medical Records. Disability claims are routinely denied due to insufficient medical evidence to support the claim. There may be several reasons why your medical records are not in your file. For example, your doctor’s records department may not have ever processed the insurance company’s medical records request. Or, the insurance company may have failed to request some of your medical records. You should periodically ask your disability carrier for a list of the records it has requested and a list of those it has received. If some records are missing, you should make sure that your insurer requests the appropriate records or even provide the records yourself. Doctor’s Statement. Perhaps the single most important evidence in a disability claim is the opinion of your treating physician. You (or your attorney) should ask your doctor to provide a detailed opinion as to your work-related medical limitations. Note: You should not rely on the Attending Physician Statement forms provided by your insurance company. These are often designed to elicit responses that would support a denial of the claim. Instead, you should give your doctor a Residual Functional Capacity form that is customized for your medical condition(s) or write a letter that details exactly how your impairment limits your work abilities. If your treating doctor refuses to support your LTD case, you should seriously consider finding a doctor who will. The definition of the term “disability” is unique to each claim. You should always check your long term disability insurance policy for the exact definition of the term “disability” to see if you can meet it in your case. To make things even more complicated, the term “disability” changes over time. Most LTD insurance plans transition from “own occupation” to “any occupation” after a certain length of time. Most policies have an “own occupation” definition of disability for the first two years you receive benefits, and an “any occupation” definition after the first 24 months, or two years. Under a typical “own occupation” LTD policy, you are considered “disabled” if you are unable to carry out the duties of your own individual occupation (this is your “own occupation” or “own occ” for short). An “any occupation” policy defines the term disability much more broadly. Under an “any occupation” (or “any occ”) standard, you are considered disabled if you are unable to perform the duties of “any” job. Your long term disability policy may specifically exclude coverage for certain medical conditions. For example, medical impairments related to alcohol or substance abuse are typically excluded from coverage. Moreover, medical conditions that are based on subjective complaints rather than objective testing (such as depression, fibromyalgia, or chronic fatigue syndrome) may be limited to 24 months of benefits. Under the above “Pre-Ex” exclusion, you would be “excluded” from coverage if: (1) you stopped work within one year of the insurance policy taking effect, (2) you stopped work due to a medical condition; and (3) you received medical treatment for that same condition in the 3-month period before the policy took effect. For example, let’s say that you have a back pain disorder, but you found a job that could accommodate your condition on December 15, 2013. With your first paycheck, you see a back pain specialist on December 22, 2013 for treatment of your back pain condition. As part of your benefit package, you are eligible for Long Term Disability coverage, effective January 1, 2014. Over the next several months, your back pain condition worsens and you stop working on October 1, 2014 due to limitations caused by your back. You file for LTD benefits. This claim would likely be denied under the “pre-existing condition” exclusion because: (1) you stopped working within 1 year of the LTD policy taking effect; (2) you stopped working due to a back pain problem; and (3) you treated for back pain during the three month period before the policy took effect (December 22, 2013 is between October 1, 2013 and December 31, 2013). If you are in the process of filing an LTD claim or are already receiving LTD benefits, you should be aware that your insurance company may be conducting video surveillance on you. Insurance companies are willing to hire private investigators to record your activities to determine your level of impairment. If these investigators record you on tape performing activities that are inconsistent with your allegations of disability, your claim could be denied. Or, if you are already “on claim”, your previously approved claim could be terminated. You should always follow your doctor’s advice with respect to any limitations placed on your activity level. If your physician has advised you to walk with a cane and avoid lifting more than five pounds, you should avoid walking without a cane and lifting and carrying heavy bags of groceries. You should be aware that there are specific deadlines when applying for LTD benefits, and when filing an appeal in your claim. Most long term disability insurance plans governed by ERISA give you 180 days to appeal an initial denial. Although this is almost six months, you should be sure to submit all medical evidence as soon as possible in the appeals process. Note: Under ERISA law, federal courts are limited to considering only the evidence contained in the administrative record, so you should not wait until your case is in federal court to present medical records, doctor’s attending physician statement reports, third-party statements, or any other evidence helpful to your case. If the evidence was never submitted to your insurance company, it almost certainly will not be allowed in federal court. You should use the 180 days to find and hire an experienced LTD attorney who will help gather medical records and other documentation to “stack the administrative record” with favorable evidence. If you miss the 180-day deadline to complete your appeal, you will not be allowed to sue your insurer in federal court because you failed to “exhaust” your administrative appeals. The deadlines should be identified in your decision letter. Look for any deadline on the notice of denial from your insurance company, and file your appeal as soon as you can.